The Covenant Polytechnic, Aba (CPA) First Semester Examination Date for all National Diploma [ND] and Higher National Diploma Students for the 2017/2018 Academic Session. 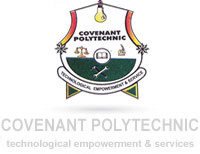 This is to inform all students of the Covenant Polytechnic, Aba that the 1st semester exams start on Monday 28th May for all HND2 and HND1 Osisioma campus. Collection of exam clearance start on Thursday 24th May, 2018 at former E/E campus. All HND1 are to create their CBE login details, Contact person for osisioma is Ms Peace while Main campus students can contact Moses.